A young man was aroused late at night by the storm raging outside his beach house. He tried to go back to sleep, but the din of the waves wouldn’t allow it. Finally, restless, he climbed out of bed and padded across the carpet to the window that faced the sea. Black clouds crowded the sky, and the darkness was pierced periodically by splinters of lightning. The agitated ocean churned and frothed. And in the gloom, the young man spotted something moving in the surf: a shadow dancing on the waves. The tumult caused by the storm suddenly increased tenfold. It was all he could hear: howling wind, rolling thunder, shifting tide. Mixed in with the uproar was a fair voice, singing an alluring melody. The song whisked through his mind until it was all he could think about. The young man’s feet stumbled toward the door. He burst into the tempest. The freezing rain soaked through his clothes and skin, until he was trembling uncontrollably, but the man staggered on. He had to find the singer. He stood on the beach, letting the wet sand squish up between his toes. “Where are you?” he cried frantically. Desperate tears streaked his cheeks. A shadow drifted toward him, walking through the shallows. It seemed to almost float above the water. The song became deafening, and the man knew: the shadow was singing. The swirling sky above parted just enough to let a beam of moonlight slice through the night. It illuminated the shadow, and the young man could finally see: it was a woman, with jet black hair. 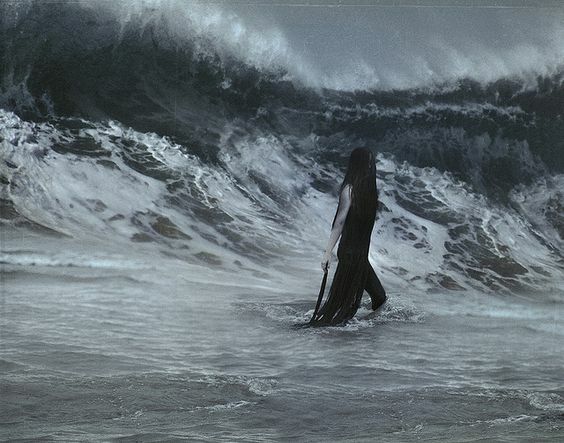 Her tresses formed a curtain over her face and trailed in the water at her feet. The man wobbled toward her, his hands outstretched. The woman gave him a thin smile, and a great wave reared up behind her. It crashed over them, leaving De Marea unharmed, but sweeping the young man to his death.